TWO volunteer-managed UK rail enthusiast societies joined forces to operate the first (and probably only) comprehensive tour of the railways in Jordan in mid-May. The tour was run by the Branch Line Society with the LCGB from May 10-15. It took more than two years of planning with local rail and tourism operators assisting in making the trip a great success, based upon feedback from participants. The tour used several different locos and successfully traversed the remaining operational section of the unusual 1,050mm-gauge former Hedjaz Railway (HR) between Al Mafraq-Amman-Ma’an to the 1970’s constructed junction with the Aqaba Railway Corporation (ARC) line north of Batn el Ghoul and then the ARC freight line to Aqaba Port, located on the Red Sea. The entire tour was run through the Jordan Hedjaz Railway (JHR). Currently the former Hejaz route from Damascus, Syria to Medina in Saudi Arabia only remains operable within the Kingdom of Jordan. The northern section across the Syrian border north of Al Mafraq reportedly saw its last passenger train on January 1, 2011, prior to the Syrian civil war. 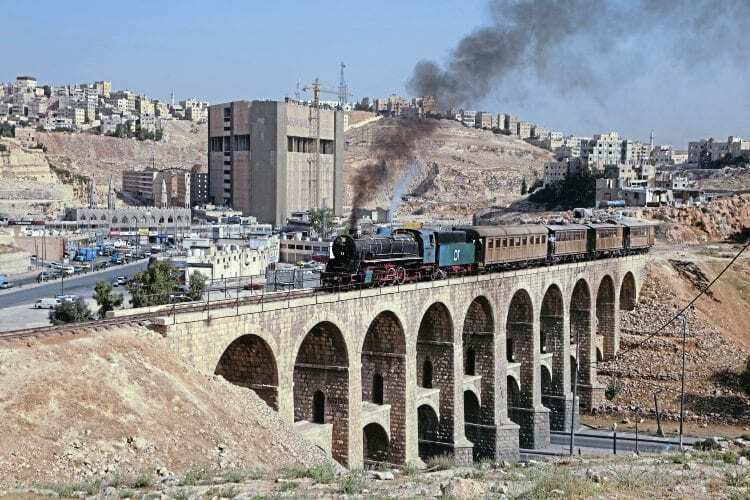 Although nominally operable between Al Mafraq, north of Amman, southwards to Qatraneh, currently the only regular train operations by JHR are Friday/Saturdays-only excursion trains from Amman to Al-Jizah.